Home » Kitchen Remodeling » Kitchen BackSplashes & Why You Need One! Kitchen BackSplashes & Why You Need One! This entry was posted in Hanover Kitchen Remodeling Kitchen Remodeling York Kitchen Remodeling and tagged Custom Kitchens Kitchen Backsplash Ideas Kitchen Backsplashes Kitchen Remodeling Kitchen Remodeling Hanover PA Kitchens Hanover PA on July 31, 2014 by Jake Sponseller. Kitchen remodeling projects can be a lot of fun. You really get to put some of your personality into your home by picking out the type of countertops, cabinets, appliances and even the hardware and accessories used to dress things up. One of the things that is often forgotten is the walls in and around these new additions to your home. People will sometimes put a fresh coat of paint or try to find a couple of pictures to hang in there but it will still feel a bit empty at times. The solution, Kitchen Backsplashes! These wonderful additions can turn a normal kitchen into something spectacular and can really capture a big piece of you and your families personality, making your kitchen feel more like home! The kitchen is often referred to as the heart of the home. It makes sense as this is where the family usually gravitates to share about the trials of ones day or grab a beverage or snack. People just naturally gather around where the food is, it goes back as far as anyone can remember. Even looking back to biblical times, they held a feast every time someone had something worth celebrating! Putting a little more of you into the space will make your guests feel more comfortable and your family more at home. A backsplash can help accomplish this task and below you will find some examples of great backsplashes that really bring out the character to the kitchen they are in. These examples are not so you can duplicate someone but rather understand that you really can go outside the box in creating a kitchen design that is your own! 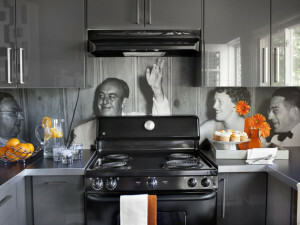 Well, you can’t get much more personal than a photo that you have taken as your kitchen backsplash! There is a trend emerging that is so simple but absolutely an amazing way to put a really personal touch on your kitchen! Simply take your favorite photo, imagine it in the space to make sure that it will work (i.e. a portrait style photo probably wont work if you plan on placing it in a wide area), take the photo to your local high end graphics and print shop and get a print on vinyl large enough to cover the area! The rest is pretty simple as this is similar to putting up wall paper from here. If you are intrigued by this idea, check out the link on the graphic to the right for instructions! Tile, Glass, Metal & Brick…What To Do! While adding a backsplash is something that is often overlooked, it is not always overlooked and some really creative people have put a lot of their personality into their kitchen. Using creative materials these awesome kitchen backsplashes really compliment the space and give their guests something to talk about! These images are posted on another blog and if you are interested in how they were completed, simply click on the image and it will take you to a post that will tell you all about it! I presented all of these to you to show that there is no right or wrong here. Obviously a backsplash is susceptible to staining and damage as the kitchen is a high traffic area with lots of sharp and hot objects so you need to make sure that it will stand up to the elements. But outside of that, the sky is the limit! If you can think it up your local kitchen remodeling contractor can probably accomplish it for you with a little bit of creative thinking and hard work. If one of these ideas inspired you to put a personal touch on your kitchen remodeling project, keep us in mind and click the Request a Quote button on the right hand side of the page. Our kitchen remodeling specialists are standing by to help you with creating a dream kitchen!